The Greater Muscatine Chamber of Commerce and Industry offers facilitation for businesses to gain access to the many incentives provided by the city, the county and the state. This service is intended to assist businesses to assist start up and mature businesses to grow and prosper within our communities. Muscatine offers tax abatement and tax rebates of property taxes to qualifying companies. This is accomplished by the 5 year Industrial Tax Abatement or by creating an Urban Revitalization District that provides a 10-year tax exemption schedule. The community can create a Tax Increment Financing District and provide Tax Increment Financing by reallocating to the project company a portion of the property taxes generated that are an increase over the base valuation determined in the tax increment area. The community has a designated Enterprise Zone intended to incentivize economic development in a given area of the community that provides tax abatement similar to the Urban Revitalization District. The Industrial Tax Abatement of 5 years is structured in a declining scale of taxes abated. The scale is 75%, 60%, 45%, 30%, and 15% and would be applied to the current levy. The levy is applied to every $1000 of value of the building and land assessment. The Urban Revitalization District exemption and TIF require a resolution by the local government involved. Tax Increment Financing (TIF) can provide funds up-front. The local government would sell TIF bonds that would be based on the projected assessment and the minimum assessment for the building construction agreed upon by the project company and the local government over a designated number of years. The TIF amount would be minus the area’s debt service portion of the taxes and it would be minus related bonding costs. While a TIF payment is received up-front, the property taxes upon which this amount is based are paid annually by the project company. TIF can also be provided as a rebate. This structure has no bond issuance and requires that the project company pay the annual taxes due on the property. The local government then repays the company annually for the taxes paid minus the area’s debt service portion of the taxes. The Rebate is valid for the number of years agreed upon by the local government and is the TIF structure granted more often by the city of Muscatine. The city of Muscatine has a policy to consider 50% of the TIF levy assessment annually for up to 10 years for an eligible project. Muscatine County does not have a specific policy. Enterprise Zones allow for partial real estate tax exemptions over a 10-year schedule. New construction qualifies for the tax exemption, as does renovation work that increases the actual value of commercial and industrial property by 15%. 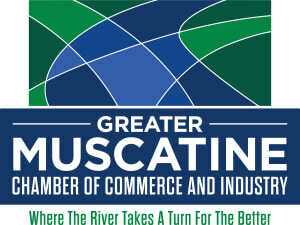 In addition, the Greater Muscatine Chamber of Commerce & Industry manages a Revolving Loan Fund for eligible projects. This fund provides low interest loan money for economic development projects up to a maximum loan of $50,000. The Greater Muscatine Chamber of Commerce and Industry will consider a loan for your project depending upon the complete and final information submitted regarding the proposed project and due diligence. The purpose of the Muscatine County Housing Development Revolving Loan Fund is to promote affordable housing in Muscatine County through both new construction and rehabilitation of existing housing. Permitted uses of the fund shall include, but not be limited to: the construction of new housing; the rehabilitation of existing housing stock; infrastructure development; interest rate buy-down and construction financing bridge loans to homeowners. In all cases, the projects will be designed to provide affordable housing for qualified households. Your project's eligibility for any of these programs and structures is subject to receipt of firm and final information regarding your project, due diligence, and is subject to approvals by the state and either the Muscatine County Board of Supervisors or the Muscatine City Council and State approvals. All costs and estimates herein are subject to the same conditions. The State of Iowa offers a wide array of incentives to businesses. Greater Muscatine Chamber of Commerce and Industry provides support to businesses to access these programs from the state. To view the many programs offered by the state please go to IowaLifeChanging.com.